Front and Rear 1000W Hub Motor Kits with PANASONIC 48V 14Ah Rack Battery. 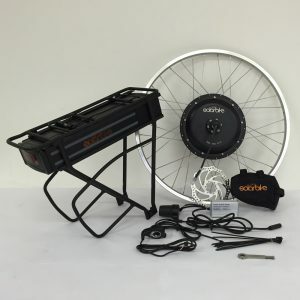 This range of conversion kits is available with 26″ or 700c rims, either for the front or rear of the bicycle. They use the high power larger direct drive 1000W motors. 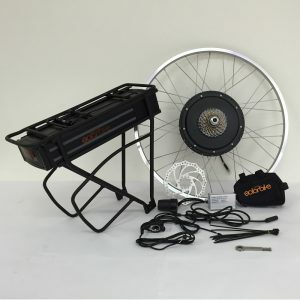 The battery is the new mould design that comes in its custom double layered rear carrier rack. The cells inside are the latest high discharge PANASONIC cells. It’s a fantastic high powered kit that allows a great range with the 48V 14Ah rack battery. 200W is the legal limit for riding on the road.